I like to experiment. 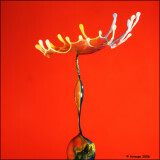 Highspeed photography, waterfigures, fast phenomenons, droplets, artistic colors etc. All this type captures need special techniques, flash light, fast detection like laser beams, sound triggers, contacts. The camera must stay in mirrorup position and wait to an external trigger event before the photo is taken. Because you need a dark room between the mirrorup en the trigger event I put a second external shutter before the standard lens. This shutter stay closed to the triggerpoint. Because this shutter act very fast, only 5 msec, most of the events can be captured. Faster events then 5 msec need a dark room like the shots on a bullet, balloons etc. This technique is reliable, so most of the shots are perfect. In this gallerie I will add regularly new experiments. Real art work. Some of the pictures are like venetian glass. Splendid. v! All I can think of to compare your photography to is fireworks. Of course, it's on a much different scale and there are neither noise or smoke. However, each shot evokes the same sort of "oooos" and "aaahhhs" that we get from seeing great fireworks explode. You make photos with the power to delight. Wow, so impressed. Thanks for sharing. fotoopa, your gallery is awesome !! Have you more explanations on your work ? What is streched on the speaker ? How the flash is triggered and delayed ? Thanks !! Finally! "Abstract ART" that I can connect with!!! SUPERB! A big vote here! Ohhhhhhhhhh! I'm going to add this to my favorites. So I can come back again and again. This is so cool and colorful to the eye and to the mind. Thanks so much for sending this to me. Very Creative Gallery, I couldn't stop viewing every one. Unusual work of art. How did they ever find my world of dreams? Better than New Year's Eve fireworks anytime !! Much thanks for revelations. I always suspected that below or beyond my level of observation that the atoms were jiving bopping rumbaing and balleting. Guest, " Have you done any annimation with them "
Animation is not possible, this figures exist only 0.005 sec ! The figures are generated via audio waves, the form of this is not predictable. wonderful photo's!! Have you done any annimation with them? This is, by far, the most incredible use of photography as art I have ever seen. Simply amazing! amazing collection! The colors, the liveliness, the energy... all mixed to beautifully! Stunning work. I enjoy seeing how your vary the background to contrast with the foreground sculpture. You have certainly discovered a world within a world, and it boggles my mind to think of the physics involved with each of these formations. great colours, very creative, well done.v. Stunning work indeed.... Cheers, Vikas. Wow! Stunning and original. " I'll be back"
Fun and beautiful as well! Excellent gallery. Very creative. GMV too. Nice work in this gallery. You've done a good job capturing your drops and have done so with great color. Well done! Voted. Like this gallery! It's amazing! Voted! These are amazing, before I read you intro, I thought they were blown glass figures. Beautiful work! Very creative !V! I enjoyed this gallery and others about your high speed photography experiments. Very interesting. Probably the most creative work I've ever seen on the Pbase or elsewhere regarding photography! An AWESOME gallery!! I'd like to see a picture of the setup used to make these beautiful captures. Vote. je suis sous le charme de cette galerie ! je suis subjuguée par tant d'adresse et d'idée ! merci de nous présenter un tel travail ! Lovely gallery!!! Beautiful creations! Congrats!! i hope some day make photos like this. very interesting !love your gallery! These are beyond a doubt the best drops and splashes I have seen. Absolutely magnificent! Absolutely amazing! Just love your art fotoopa! Whatever you're doing, keep doing it! Fantastic photos!!!!!!!! Very interesting experiments, great work. Some serious fun indeed. Brilliant! awesome stuff! I see logos in there and stop motion anime shorts, your work has so much potential. True imaginative brilliance! Great imaginative work! Very accomplished circuitry! Beautiful photos! Hum splash dancing, very critical timing because an extra synchronisation point. You have to trim the falling delay time to the oscillator swing for this figures. this figures have a lot longer delay ( near 45 msec) compared to the falling dropelts. I must thinking about this idea.